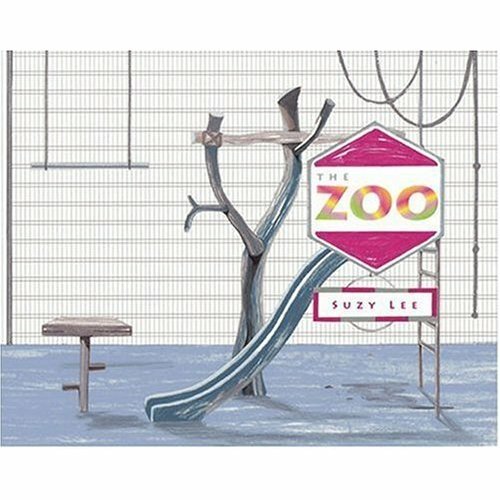 I am a big fan of Suzy Lee. Her books have few, if any, words, but convey stories exquisitely through the illustrations. Though I still feel that her book "Wave" will always be my favorite, The Zoo is another great Suzy Lee book. Synopsis: A little girl goes on a trip to the zoo with her parents. The illustrations on these first pages are washed out grey tones as the girl visits empty cage after empty cage with her family... with the exception of a colorful peacock that catches the girl's attention. She absentmindedly wanders away from her family to follow the peacock, and as she does, the greyscale background of the empty zoo transitions into a vivid green one. The following pages are a contrast between her parents search for the girl in the grey empty zoo and the girl's adventures in the colorful oasis of animals. "We watched the hippos in their pool," the book narrates, on a greyscale page where her parents are searching for her at the empty hippo pool. The following page shows the peacock leading the girl to a colorful pond with happy hippos and monkeys who have escaped their drab cages. In the end, she is found by her parents asleep on a zoo bench. As the relieved parents carry the little girl home, you can see the animals in the background watching her go and, as she smiles at them, the book states, "I love the zoo. It is very exciting."